Learn basic, beginning encaustic techniques using R+F encaustic paints, mediums and equipment in this one-day workshop. 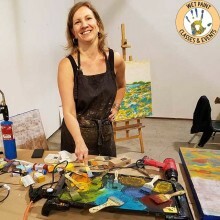 A brief history and description of encaustic painting will be discussed as well as basic supplies and tools, safety, preparation of supports (including application of grounds) and fusing. An overview of a variety of additional techniques will be demonstrated such as incorporating oil pigment sticks, mixing your own paint, creating texture and working with masks and stencils. There will also be lots of studio time and one-on-one instruction. 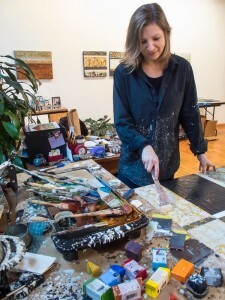 Continuing encaustic painting students are welcome “to create their own studio time”! Supplied for shared use in class: R+F encaustic paints, mediums and equipment- heated palettes, heat guns etc. Students supply their own panels. I desire to create art as my self-expression because it allows me a means to connect with others. Teaching art over the past 20 years has allowed me to expand even more. Everyone has a story to tell or a story worth hearing. There are connections to be made with everyone. We all have things in common; experiences, feelings and thoughts. Teaching allows me to understand and appreciate my students through these interactions and I am transformed.